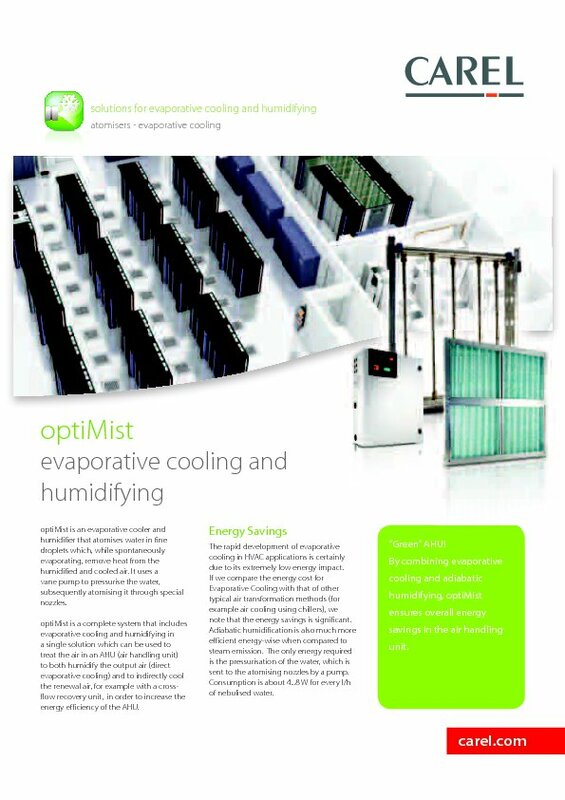 optiMist is a humidifier and adiabatic evaporative cooler that, by atomizing water into small droplets, allows the latter to evaporate spontaneously, subtracting heat from the humidified air, which is cooled at the same time. The system consists of a cabinet, inside which there is a flap valve pump, with pressures up to 15 bar, and an atomized water distribution rack, to be installed inside the air treatment unit. The sophisticated control system managed by the pCO, allowing the system to operate always at optimum pressure in a wide flow range. It is available in capacities from 50 to 1000 l/h. materials used which do not contribute to bacterial growth; can be used with demineralized water, softened water or mains water.